RoyalEnfields.com: Should you buy a Royal Enfield from a CraigsList ad? 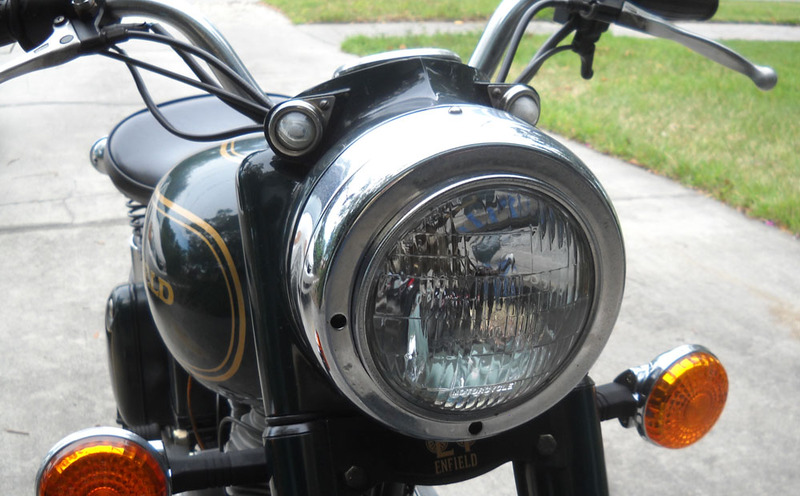 Should you buy a Royal Enfield from a CraigsList ad? Royal Enfields are adorable; but should you buy one on CraigsList? This blog lists Royal Enfield motorcycles for sale on CraigsList and eBay in the United States. So I suppose I should be offended by John Luck's very funny article in Motorcycle Classics. Luck tells how he looked at motorcycles advertised on CraigsList, finding creepy and dishonest owners and dusty motorcycles held together by J-B Weld. One motorcycle was shown in the ad only from the left side, since the right side had been skidded a long way down the pavement. An owner assured him over the phone that his motorcycle's brakes worked fine; Luck arrived to discover that the motorcycle had no front brake whatsoever. Not that it didn't work: it wasn't present. Motorcycles advertised as having run recently turned out to be in a basement, or had long ago fallen through the floor of a shed. It wasn't likely that they had run anywhere in a long time. The problem, Luck argues, is that CraigsList ads are free. "No longer do you have to consider whether or not that junker bike that’s quietly rusting back into the loam is worth the effort and time of placing a $25 advertisement in a newspaper. With free listings, and the investment of a few minutes at the computer, you can easily add your non-running scrapyard-candidate bike to the immense loop current of junk that’s being peddled on the Internet." Soured on CraigsList, he ended up buying his motorcycle from a dealer. As for CraigsList, he writes: "Too much time, too much effort, too much anticipation and subsequent letdown." I would argue that Royal Enfield motorcycles are different. The majority of the CraigsList ads you see here are for Bullets imported through official channels since 1995. A high percentage of these are low-mileage garage queens the owners never got around to riding. Dangers lurk in buying any used motorcycle sold without a warranty, of course. But it is unlikely that any of these almost unused motorcycles are completely worthless. There are exceptions, of course. Private imports from India lurk here too, and they are not always obvious — they may be undocumented aliens bound to cause heartache at the Department of Motor Vehicles. Some sellers lie, of course, in an effort to pawn off abused or broken motorcycles. But I think many sellers are typical of the kind of people who buy and own Royal Enfield motorcycles in the first place: enthusiasts, who only want you to appreciate the motorcycle as much as they do. They go overboard in the other direction, listing faults I would discount. Some openly warn that older Royal Enfields are "not for the inexperienced." They note that these motorcycles like regular maintenance. Don't buy it unless you like getting your hands dirty, they advise. You won't see these kinds of cautionary messages in ads for other brands. I don't list every ad I come across. Some are scary. Especially scary are the ads that promise that something broken is "easy to fix" (so why didn't he?) or that "you can get a title from the DMV" (so why didn't he?). Some ads I've listed here turned out to be bad news. There was the seller who copied a picture of a nice Royal Enfield off the Internet and used it in his ad; incredibly, the actual owner of the motorcycle spotted this and warned me to pull the ad. Buyer beware. In the end, I like Luck's advice a lot: buy your motorcycle from a dealer you trust. For a non-mechanic like me, it's just one more layer of protection. In the end, you'll probably save money. Read the ads listed here to see what's available out there and what prices sellers are asking. I bought two of my three Enfields off of Craigslist...for VERY reasonable prices...as long as you get good pictures,and ask the right questions,you'll be OK...never ASSUME anything,and ride it before you buy it...and if it doesn't run,adjust the price accordingly!